Welcome to the new web page of the IBK! Our eight person team of competent engineers organises, apart from its main task (the planning, consulting and installation of electrical devices and delivering expert opinions), also the world-wide sale of used plants and plant components for the generation and distribution of electrical energy formerly employed within Germany. The German market continuously offers a large number of used devices in considerable conditions. We offer a broad range of competitively priced devices for energy generation and distribution, as well as components and additional equipment. Every device we offer is in good or very good conditions and will, if needed, be subject to a general overhaul before selling. Any device requiring monitoring features a valid TÜV (German Technical Inspection) certificate. All our devices are sold with either a warrantee or guarantee. Apart from the sale of used devices, we also offer demounting, transport, installation and commissionining as also the conversion of diesel gensets to run with vegetable oil. Please consult our office if you should have special requests or look for a product not explicitly mentioned here. 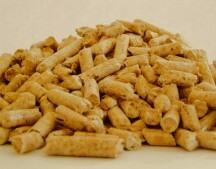 energy generation and wood pellet production was born.